The sun had chased the fog out to sea. The Golden Gate’s red spires propped up an azure sky as she spread her wings and heeled to the breeze. Her plumb stem forcefully shouldered aside the boiling ebb, delighting the gawkers ashore who never saw this display of grace and power by the schooner Wander Bird on San Francisco Bay. I was savoring the memories of this magic day in 1998, which seemed a century ago, as I descended the spiral steps of the narrow companionway into the vast and dark-paneled main cabin, with 14 bunks and a large, gimbaled dining table. But the vessel no longer has the words Wander Bird painted on her stern. She had assumed her original name, which was much more pragmatic: No. 5 Elbe. And she no longer was docked in Sausalito but in the Port of Hamburg, the place the 110-footer (sparred length) was launched by the Stülcken yard as the fifth in a series of pilot schooners for the German emperor in 1883. 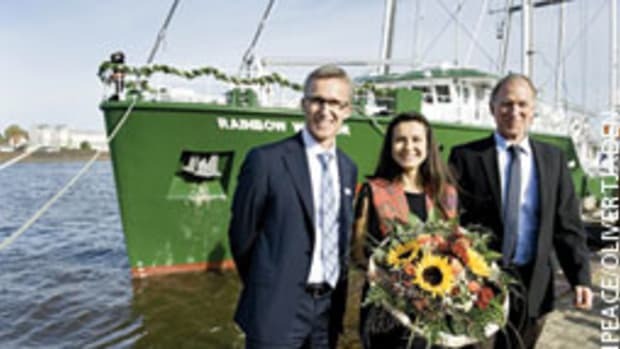 Her job then was as simple as it was difficult: delivering pilots to incoming ships so they could help negotiate a 60-mile stretch of river from Cuxhaven to Hamburg. These schooners had to be quick because only the first pilot to arrive at the boarding platform got the job … and the cash. They had to be stout, too, because the North Sea is rough, especially around the mouth of the Elbe. And they had to be managed by a small crew, at least on the way back to port after the pilots were discharged. The business model was lucrative, but schooners soon were replaced by combustion power. No. 5 hung on for 30 years before she was taken out of service and headed for the scrapper. Enter Warwick Tompkins, an American writer and adventurer who was looking for a seaworthy yacht for family cruising. 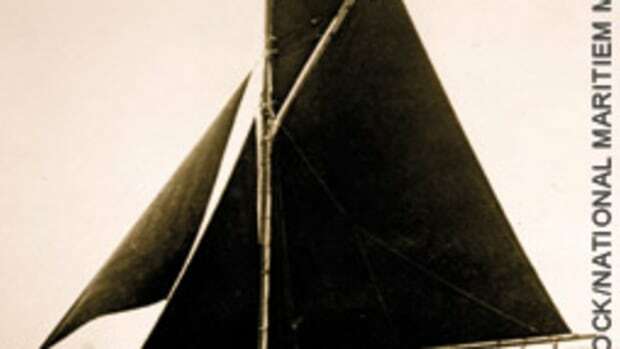 In 1929 he happened to come to Hamburg and found the schooner, which by now was named Wandervogel and looked like a wreck. Upon closer inspection, Tompkins found enough good substance in her structure, so he bought and revitalized her. The purchase price reportedly was $1,500; the restoration was $15,000, which he had to bum (or borrow) from wealthy friends. 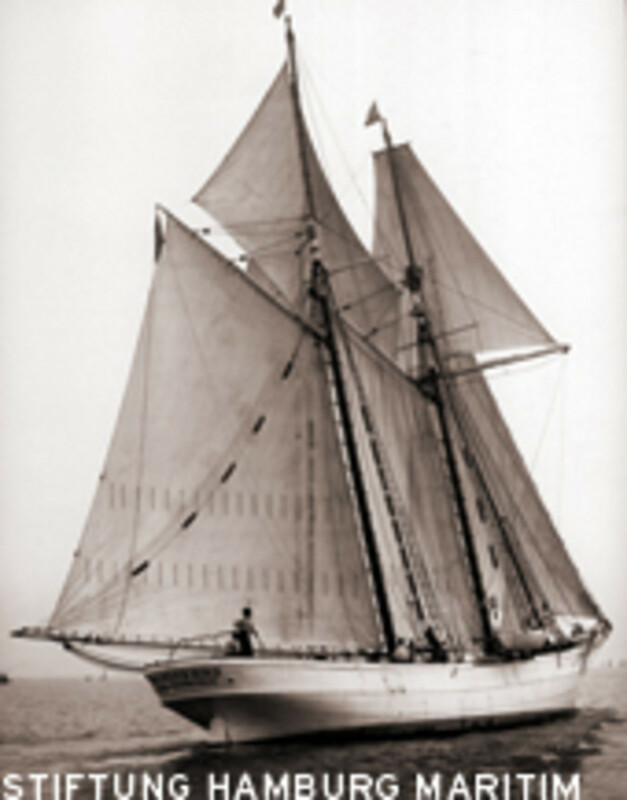 He renamed the vessel Wander Bird (English for Wandervogel) and proceeded to cross the North Atlantic 13 times, once setting a record for vessels under 100 feet with a time of 16 days and 21 hours. Wander Bird’s most epic voyage took her around Cape Horn. It commenced June 26, 1936, in Gloucester Mass., and ended Feb. 21, 1937, under the Golden Gate Bridge, via ports in Europe, North Africa, Brazil, Chile and California. The ship’s company numbered 10. In addition to Tompkins, there were his wife, Gwen; his two young kids Ann and “Commodore” Warwick Jr.; bosun William Palmer; cook Albert Harrison; and four guests, who had to pay for the privilege of crewing. Their adventure, including a month-long battle to get around the Horn, was described in Tompkins’ book “Fifty South to Fifty South.” Fighting nasty westerly gales that rose to hurricane force at times and sailing 2,300 miles to make good 1,000 — with the children ages 4 and 6 — created the legacy of this ship under my feet that now placidly tugged at her lines a stone’s throw from Hamburg’s futuristic symphony building. Wander Bird became a burden to Tompkins after the war; he took a greater interest in politics than in dealing with his schooner. There was no money around, so she rapidly declined and served as a stationary dwelling for the “Commodore,” now a young man. In the 1960s, the family sold her to a group of owners who lacked the commitment and wherewithal to restore her. If it weren’t for Harold Sommer, a tug captain with German ancestry, the vessel, which was de-rigged and had fallen into serious disrepair, would have met the wrecking ball. 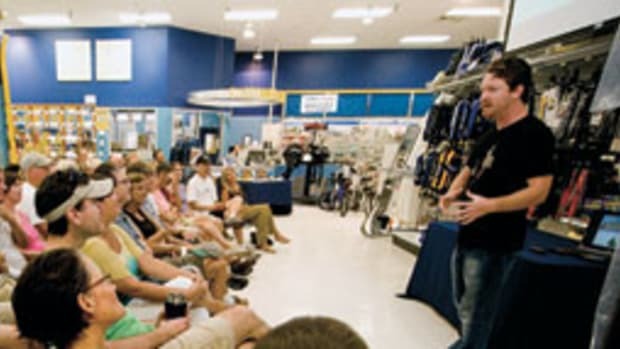 Sommer wasn’t wealthy, but he was resourceful and had friends who chipped in — with gear, with money, with sweat equity. “It was a monumental project, the largest restoration in the U.S. [at the time] that was financed by private parties,” Sommer told me back in 1998. 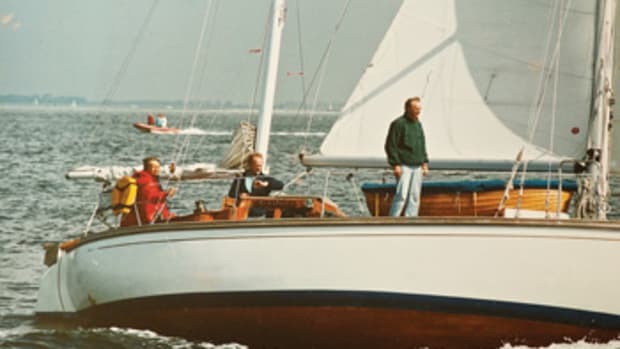 By “monumental” he meant replacing stem, stern, planks, ribs, bulwarks, railing, rudder, steering, binnacle, hatch covers, hardware and portions of the interior. He also added an auxiliary engine and replaced the rig. “Absolutely irrational and undercapitalized,” he groused. However, his patience and persistence paid off. 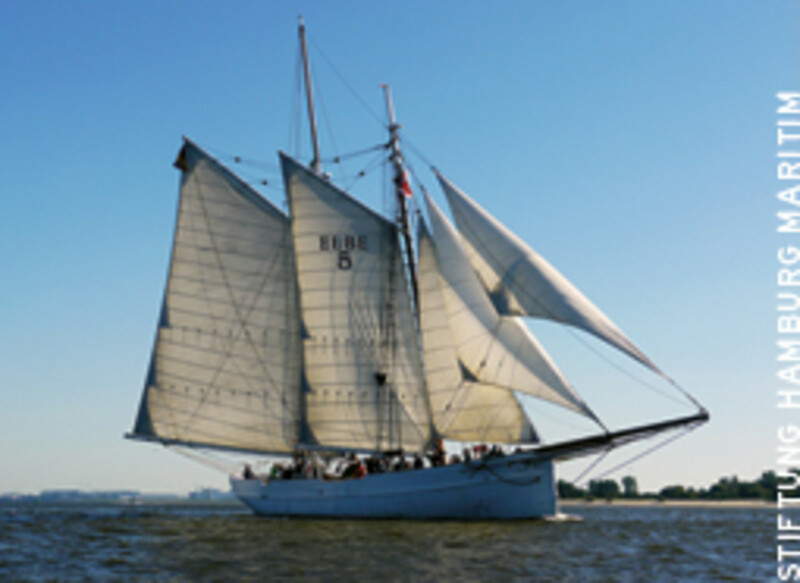 Wander Bird was a proud schooner again, slipping the lines June 1, 1981, for the first time in 40 years. But even the most dedicated owner eventually has to move on and sell up. After 1995, Sommer was looking for a buyer, without luck, until two art dealers took her off his hands for a song and brought her to Seattle, where they kept her for three years. 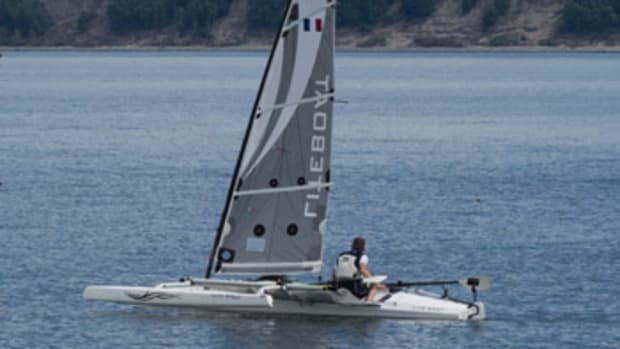 She once got off her mooring and washed up on Vashon Island, luckily on a sandy beach, not on a ledge. It was again time for Wander Bird to find new owners and a new home. And her good streak continued; 5,000 miles away, someone was itching for a traditional vessel and was prepared to spend some cash. His name is Joachim Kaiser and he had one particular character trait that made him the ideal suitor: utter craziness for old and dilapidated vessels in dire need of help. 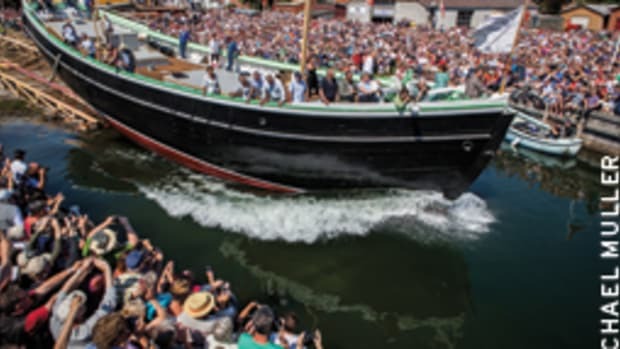 What followed was a complete restoration in multiple steps, overseen by Stiftung Hamburg Maritim, a non-profit for the preservation of the city’s maritime heritage that owns and operates several classic vessels. The process was managed by Kaiser, who also had a hand in finding donors and sponsors. The work was carried out by another foundation that helped young adults get started in the workplace. In essence it was déjà vu Tompkins 1929 and déjà vu Sommer in the 1970s. The schooner was fitted with a new deck, a new main mast, two new common-rail diesels and new copper sheathing on the bottom. The steering system was switched back to a giant tiller (a copy of the original), which replaced the iron wheel that was donated by actor Sterling Hayden, himself a schooner man. When she got her original name back, No. 5 Elbe, she was finally home. At her relaunch, she had very special visitors: “Commodore” Warwick Tompkins and his sister, Ann — in their 70s — came to wish her well and refresh childhood memories. 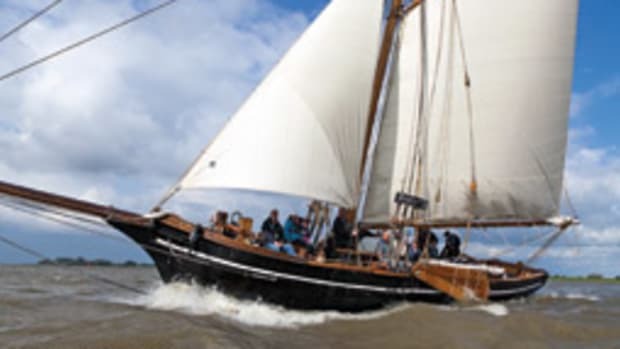 Like few other vessels, this schooner has been sailing under a lucky star for more than a century and has logged countless miles across the world’s oceans, up and down the Elbe and around San Francisco Bay. 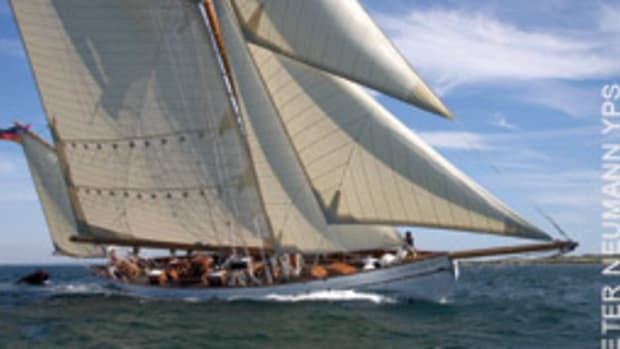 She always has found the right people, fools perhaps, who managed to bring her back from the brink with persistence, pluck and sacrifice so they might spend a magic day aboard this pilot schooner, just as I did back in the 1990s on San Francisco Bay.